Hwang Jung-Min investigates the Black House. The Skinny: A meek insurance investigator gets sucked into a dangerous game of cat-and-mouse in this involving psychological thriller. Hwang Jeong-Min delivers a magnetic performance as the film's underdog protagonist. Starting a new profession can be difficult, but really nothing when compared to what befalls the protagonist in director Sin Tae-Ra's chilling 2007 film, Black House, when he joins a local insurance company. Just as he's settling into his new job, mild mannered Jeon Jun-Oh (Hwang Jung-Min) fields a telephone call from a woman asking about her insurance policy. As innocuous as that may sound, the ensuing conversation quickly turns out to be anything but routine. The woman begins by asking whether the company will pay out even in the case of suicide, and Jun-Oh, still deeply affected by the self-inflicted death of his own brother, becomes a de facto suicide hotline operator and tries to convince the caller that she has numerous other options available to her. In the process, he accidentally reveals some personal information about himself, and the woman hangs up. And that's just the beginning of the weirdness. A few days later, a client named Park Chung-Bae (Kang Shin-Il) asks for Jun-Oh by name, requesting that they meet at his house to discuss the details of his insurance policy. Not long after Jun-Oh arrives at the client's oh-so-creepy place of residence, the "Black House" of the title, he is shocked to discover Park's seven-year-old stepson hanging from a noose. The authorities are called in to investigate and all the evidence points toward suicide, but Jun-Oh isn't so sure. Park's odd behavior convinces Jun-Oh that something sinister is most definitely afoot. Although the insurance company is legally obliged to pay Mr. Park, Jun-Oh convinces his superior that they should conduct their own private investigation just to make sure. Curiously, the already jittery Park acts even more suspicious thereafter, as he shows up at the insurance company's office on a daily basis, each time hoping to receive his fat check. Clearly, the man is in dire straits financially, but would he really go so far as to murder an innocent child? The answers may lie in Jun-Oh's one man investigation, as he begins to discover some disturbing details about Park's past - but is he really the murderer? Or a huge red herring? Along the way, Jun-Oh learns that Park's wife, Shin (Yoo Seon), has a huge life insurance policy taken out on her as well, and he tries to warn her before she suffers the same fate as her now deceased son. But wasn't she the voice on the phone? Some unsettling scars on her wrists and a strange limp suggest that she's the victim of some kind of abuse and perhaps even coercion. But she's not the only one potentially in danger, as we soon discover that Jun-Oh's single-minded quest for justice comes with a price, endangering those closest to him. But who is the real culprit? Based on the novel by Yusuke Kishi, Black House is less an out-and-out horror film and more of a psychological thriller, and that approach is particularly refreshing when you consider the sheer glut of Ring rip-offs still clogging cinemas under the generic moniker of "Asian Horror." Still, even as it contains this edge-of-your-seat amateur investigation, the film almost derails completely the moment that the killer's identity is revealed, perhaps in large part due to the rather extended climax at the titular "Black House." The décor of the final chilling location seems like it's straight out of a Saw film - full of blood, guts, and numerous dismembered body parts-and it's so gory that it almost seems out of place considering what came before. Certainly, on one hand, the finale is reminiscent of Silence of the Lambs in terms of sheer creepiness, but it goes on for a bit too long and the struggle with the real killer is almost laughable considering who is involved. Still, the impact of the scene is palpably felt, and there's one bloody image involving a set of car keys that I won't soon forget. In that sense, the decision to "pour on the gore" in the finale is both a help and a hindrance to an already effective film. Your mileage may vary. The key to the entire film is really Hwang Jung-Min's performance. His geeky character is honest and forthright - almost to a fault - in his quest to see that justice is done, and Hwang is able to convey that in ways that go beyond scripted dialogue or action. 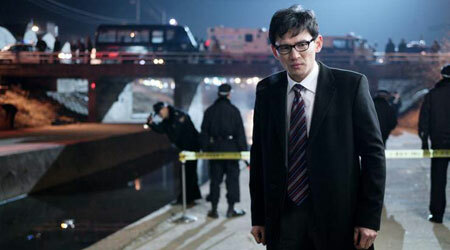 In effect, Hwang subsumes himself into the character, making for a very convincing, if unconventional hero. What is even more intriguing is how Hwang gives the character more shades that one might expect, considering his almost Dudley Do-Right attitude to life. Although there's nothing really overt about this in terms of dialogue, his performance at certain moments actually throws into question the line between sanity and insanity, as Jun-Oh himself seems a bit off his rocker at times, despite the "aw shucks" everyman quality that Hwang successfully exudes throughout the entire picture. The film's ability to simultaneously be a detective film, while also subtly implicating the detective himself, is a welcome nuance in an otherwise simple and straightforward film. Notes:  Yusuke Kishi's 1997 novel was made into a 1999 Japanese film by Yoshimitsu Morita also titled Black House.